In the modern era were our jobs are planned down to each 15 minutes slot of the working day and we have annual performance reviews, and appraisals, where we are not only expected to have defined inputs (research expenditure, students, staff, etc. ), outputs (publications, patents, etc.) but IMPACT as well. Impact is the next big science metric. The one that is fashionable at the moment is the so called H-index. I must get asked at least once a week what my H-index is; it is as if we are in some kind of competition on a league table. When I was introduced a few weeks ago at a meeting the chairman mentioned my H-index, which was really irrelevant to the task at hand. In the UK we have the ‘Research Excellence Framework‘ or REF that judges the quality of our research and is responsible for defining our funding. In the last REF a proportion of the assessment was based on IMPACT. We have been told that for the next REF this proportion will increase. 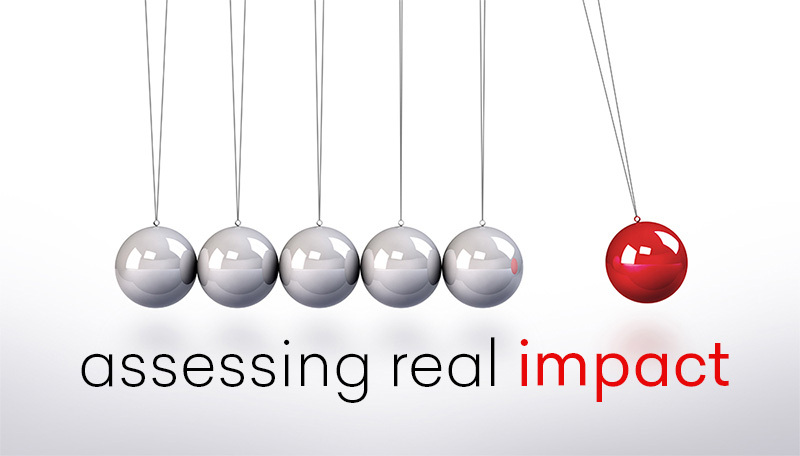 The problem is how do you define research IMPACT and how do you measure it? As part of our preparations for the next REF we need to document, and show, whether or not the amount of time our group spends on public engagement and PPI (patient-public-involvement) is having any impact. If it is having no impact we will have a difficult time justifying the extraordinary amount of time we spend on it. This is the primary reason why we submitted the poster below to ECTRIMS. This poster is the beginning of a body of work we will perform over the next few years to collect data to show we have impact, or not. Does our blog have impact is the question we have to answer and is the reason why Alison recently ran the survey on the topic that so many of you completed. Thank you. Documenting impact is going to be time consuming and in a previous era would have been seen as a waste of time. I personally think it is a distraction; impactful research is usually obvious and you don’t need to define it with a metric. Unfortunately, we have to play the game; our positions, funding, etc. depends on it. Could you please do a post dedicated to the long term results surrounding Lemtrada? There's seems to be a lot of conflicting information out there, or at least it's being presented in different ways depending on the source. While it's great someone may not have experienced a clinical relapse, it's equally important to include MRI activity. They may have acquired silent lesions in this time… their disease is therefore active and the next lesion may not be so silent. You quoted some percentages each year in a comment previously. I presumed this was NEDA, but given that only 39% of people were NEDA at two years from the CARE-MS studies, it's impossible to have a NEDA value above this as you quoted up to year 5. Many thanks for the informative posts you do and I hope to see the long term Lemtrada data clearly explained soon. On the up side, easier for Clinical Medicine than some of the other disciplines. Does this blog have an impact? How can that even be questioned? InterNut impacts in areas of research, medical blogs I would think generally are pretty hard to measure. Our site has been online a bit over a year. How do we measure impacts? We measure them by working to reach waypoints more so than most other measures. But here? This blog? Impacts are clear as a bell in many many respects. Our venue has been around a little over a year so its been less than that since I found BartsMS Blog. In that short time I have watched how this blog, Prof. G, Doc Baker, Klaus, Dr. G have not only informed pwMS about research but used the venue to transform the landscape of MS. Brain Health Matters is an example that probably would never have happened if it were not for this venue. IMHO it is one of the most foundational documents ever to exist in MS. Ever! Can a price be put on that? I think not. Here a handful of compassionate and driven researchers and clinicians changed the world. 2.n million people. No. The landscape of MS encompasses more than 20+ million people when one takes into account families alone. Individuals! Did you all stop there? Nope. #ThinkHand again brings to light so many issues. Not just about PPMS and clinical trials but thinking about more granular ways to assess MS! My goodness! This should have happened after Tysabri hit the marketplace. At that point, Interferon and Copaxone existed. So, three diverse choices and three different efficacy ranges. #ThinkHand brings to light that measurement systems in MS are pretty darned flawed. Closing my eyes I can do the Peg Test faster than my fiance' who does not have MS. Walking, there are days I lag behind him. Other days he is trying to keep up with me and I have gait issues and rather random weakness in one leg. Then what do you all do? At the largest MS research conference in the world… BAM… You all bring attention to it. The big debate with Klaus and Patricia. Did ANY other entity there of the myriads of them do any such important debates? Double-Bam… In the poster exhibit does Barts do the standard printing press? Nope. Cardboard and markers, simply brilliant. What sets Barts apart is that not only do you all perform research, read all about it, disseminate it to many pwMS but you are all motivated and driven. Its' more to you… WE who LIVE WITH MS are MORE to you than a paycheck. One might argue, "All clinical and researchers are." I can count on TWO HANDS how many put forth the additional effort you folks do and all of you take up one of those hands. I dont know of Allison or the others in the background. They too should know how much of a difference they have made in MS lives. I mean… Thats only two things in this past year both which probably never would have happened if it were not for this blog. I could go on and would be happy to do so!